After my successful cross country season, I’m excited to see what this track season holds in store. The focus will be on the larger scale meets like Arcadia, CCS Top 8, and the postseason racing cycle. Ideally, I would like to bring my 3200m time under 9:30 and my 1600m time under 4:25. Working with speed and interval workouts will be key to notching more PRs this season. This year’s track season will have more of a team feel since my 1600m time will help us qualify for the DMR and the 4×1600 relay at Arcadia, while my 3200m will help us score points at important meets like CCS Top 8 and CCS finals, allowing us to have some chances at winning larger meets as a team. I will strive to stay healthy and maintain a consistent training schedule to achieve my goals this season. A successful track season would be a good swan song to my high school running career, and a good way to springboard into my collegiate career, if I decide to continue running then. It’s time for the Power ARML, which is one of my favorite math contests. The atmosphere within the math room is rife with collaboration and ideas. Today’s power round topic is Tetris. Most of the team is excited because many of them are familiar with the game dynamics and techniques. We delegate the problems between members, and the scramble begins. After 30 minutes out of the allotted 40, we are done with almost all of the power round problems. The team is waiting on me for a few crucial calculations that will be important for another problem. However, time is running out and I need to find a more practical way of solving my problem. Brute force approaches will only get you so far. 3b. If the puzzle is ten spaces wide, there are 10C2 = 45 different patterns where two squares remain on the bottom line and all other squares have disappeared. Some of these patterns can be achieved with just one row disappearing while others require at least three rows to disappear. How many of each kind are there? If you try to repeat part (b) of the previous problem but without using the “T”-shaped block, you will discover that some patterns still require only one line to disappear, others require three lines to disappear, but now some are impossible altogether. 4a. Determine how many of the 45 patterns still require only one line, how many require three, and how many are now impossible. 4b. Give a simple explanation why some patterns are impossible without the “T”-block. The seven different tetrominos used in Tetris. The “T”-block refers to the purple tetromino. I tried thinking about what distinguished the T-block from the other tetrominos. Suddenly, thoughts of chess and different pieces wandered into my mind. I had to stop getting distracted – there wasn’t a whole lot of time left. But wait a minute, chessboard… black and white – parity! It all came together, it was parity! If you put all the tetrominos on a chessboard, a T-block covers three squares of one color and one of the other, while the other tetrominos have an equal split of color. I quickly wrote down my solution and shared it with the other team members. We extended my parity argument and casework and floated through the other remaining problems with little time to spare. My chessboard epiphany made me realize that solutions could come from anywhere. I just have to look in the right places for innovative ideas to approach different problems. At the outset of the season, I didn’t think I was going to make it this far. Making states was a pleasant surprise for me. However, qualifying for the race was only half of the story. Since CCS is normally the first section to hold their races, we had two weeks to train before the big race. Our workouts were a mix between speed and distance to help us get geared for states. It was tough for me to get through practice the first few days since I had just run the Big Sur Half. We drove to Fresno Friday afternoon. The weather was quite pleasant, increasing my confidence about the race. We met Justin, Grace, and Jake at a nearby parking lot before our course jog. After a prolonged season lasting more than five months, it was just the three of us. We had made it this far, and it felt much different for me. I felt… alone. There wasn’t the jovial atmosphere of practice anymore, having reduced to one that of solitude and sincerity. At this point it was all business for us. After our warmup, we hung around the finishing gauntlet while we waited in line for our free t-shirts. I guess making states had its perks. My mind was uneasy however, similar to the situation the night preceeding CCS. It was the same feeling – I had to go out and perform. On the other hand, I was excited to finally have the opportunity to run in a such a big and prestigious meet. Our race was early in the day, like Clovis Invite a month ago. This time, we were running three hours later. Justin and I did a few rounds around the perimeter of the park for a warmup, and after a bit, we were ready. Since the start line boxes were arranged by seeding, Justin and I would be starting in different places. By virtue of his top individual performance at CCS, Justin would start in the center, while I would be starting on the far right, since I was the last individual to qualify from CCS. I thought that if I went out a bit more aggressively at the start, I would be able to compensate for my slightly subpar starting position. However, this was easier said than done. The start was very aggressive, with everyone in the race pushing the pace hard. I found myself in the middle logjam within the first 800m of the race. I kept my pace through the first mile, and because of the hard start, I found myself tired somewhat. Although I came through at 4:53 for the first mile, the same split as my Clovis race, I was much more exhausted at this point. I tried to hang on as much as I could. The race became a struggle to simply maintain a steady pace. My legs started to ache harder and harder. 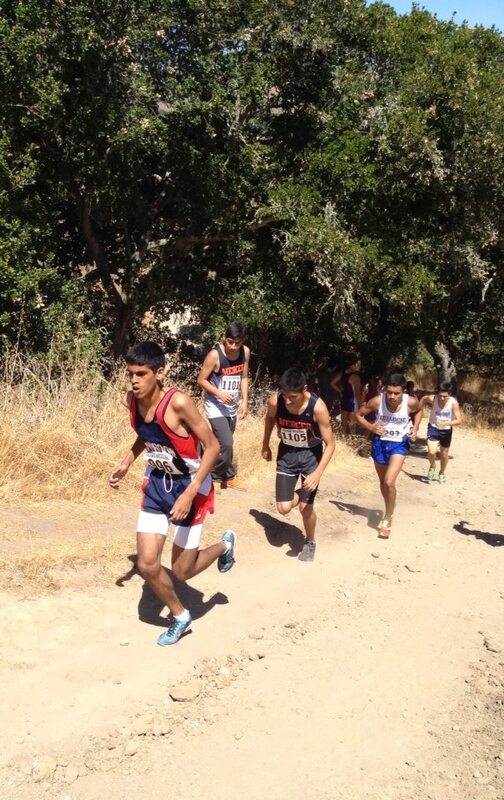 I pushed the last 1200m, knowing that this would probably be the last race of my high school cross country career. I was gaining ground and position, and sure enough, I was able to reel in a few more runners by kicking through the last 150m. I finished in the top 50% of the field with a 16:28, or a 5:19 pace per mile over 5K. I was hoping that I could have ended my season on a much higher note. I initially felt that I had let my supporters down, after all that they had invested in me. However, I was more than happy that I had the chance to run in such a race and make it to states. My final cross country season was a success – I had improved my 5K time by more than a whole minute, and I had also definitively broken the elusive 10 minute barrier in the 2 mile, something I was unable to achieve last year in track. Though my season ended on a somewhat bitter feeling, I am excited for what track holds in store. There will be many opportunities for big PRs in both the mile and two mile, and I am eager to see what I am capable of achieving on the red rubber this year. With big meets like Arcadia, Stanford, and CCS Top 8, who knows what will happen? Only time (and some careful, disciplined training) will tell. 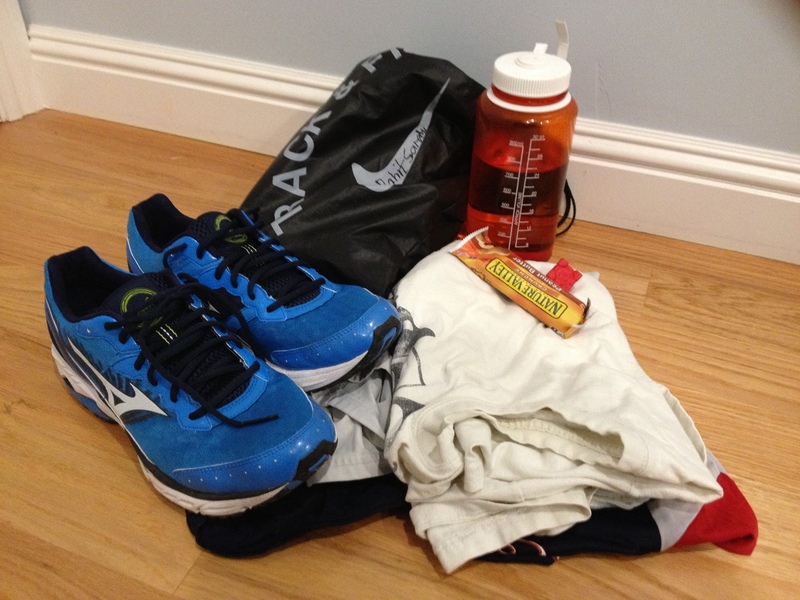 This weekend was a busy one for me – by no means was running two races an easy feat for me. I was prepared, though, and I was excited to run in both. Though CCS Finals was the more important of the two races, I was excited to run in the half marathon because the distance generally felt much more relaxed to me, with regards to pace. We had to wake up early to get to the start line, since we weren’t staying overnight in Monterey. Surprisingly, I didn’t feel too tired waking up at 3:30 to leave for the race. It was a good sign. The racing conditions were perfect, and would have had any distance runner drooling over them. It was 55 degrees, overcast, with no wind except for the light sea breeze coming in from the coast. It was PR weather. New day, new race. All ready for the start! I was shooting for a big PR, aiming for a sub-80 minute finish. My start reflected my goal, and I pushed the pace aggressively in the first mile, coming through at about 5:44. I began to feel a little bit of pain, but I ignored it, following some older runners as we went through the tunnel towards the wharf. We bunched up and stringed out, occasionally forming a small pack of about six runners. The next few miles were somewhat challenging for me. The course would make a few 90 degree cuts, following a few steep inclines. I accelerated a little bit and started to lead the thinning pack. My strides followed a steady rhythm, similar to the one I would hold during Parker Ranch hill repeats. I crossed the four mile timing mat in 23:38. I was happy with my pace, and continued to hold my line for the next few miles. I drafted off of other competitors, occasionally surging forward and taking control of the smaller pack. At the 7.7 mile turnaround, the pack dissolved for good, with a few runners making a longer surge over the next two miles. I wasn’t able to cover the move, but I continued to push for sub-6 minute miles. I had to run the next few miles on my own since the field had completely thinned out by the ninth mile. The next competitor was about half a minute ahead. I tried reeling him in, accelerating past the 11th mile timing mat in 65:21, but he started to pull away. I was slowing down a little bit, and then two runners started to inch past me. I held pace with both of them, and then started to kick past the 12th mile. I was starting to feel a little bit of pain with 800m to go. I pushed even harder, ignoring the slight twinges in my foot. Near the finish, I was able to draw off energy from the large gauntlet, helping me kick faster. I crossed the line in 77:31, or 5:54 pace for 13.1 miles, nearly a seven minute PR from last year’s breakthrough race. After we checked the chip timings, my time was adjusted to a slightly better 77:26, good for first place in my age division. Crossing the finish and notching a new, 7-minute PR! It had to have been the scariest race ever. I wasn’t able to sleep properly the entire week. I couldn’t think about anything else except today’s race. The night before, I woke up around 2 am in a cold sweat, unable to fall back asleep. I tried thinking about other things instead, but CCS weighed too heavily on my mind. The division II races were early in the morning, so we were the first ones on the course. I warmed up with my teammates on Crystal Springs for the last time. We jogged downhill and made our way to the edge of the course. We stretched for five minutes, in silence. The only noises were the footsteps of the other teams and the wind rustling through the undergrowth. It was a serene scene, and I felt at peace before the most nerve-wracking race of my high school career. We did what might’ve been my last woh-bundy ever. The gusts started to pick up as we lined up on the start. We were four boxes from the far right, so we had to get out fast and take control of the middle of the trail. Start of D2 Boys Race. The start was faster than I thought. I invested a great deal of energy striding down the hill, vying for important position. I was boxed outside and had to reroute around to regroup with the lead pack. After the first K, I was where I wanted to be, albeit having spent a considerable amount of energy reaching that position. I tailed the lead pack until they started to string out, climbing up Heartbreak Hill. Coming off of the first mile mark, just past the climb up Heartbreak Hill. People began to pass me, and I was losing position. First it was a few runners, then they started to trickle past me. I stemmed the trickle and ran alongside a St. Francis runner for the next half mile. My form started to break as I flailed downhill and around the winding turns. I got a grip on myself after we crossed the 2 mile timing mat. It was time to go. I pushed up the hill, catching more runners and regaining the lost position. I couldn’t really tell where I was individually, but I could feel some people tailing me in the last 1200m. I was a little conservative going up the last few hills, but I held my line, making sure I didn’t lose any position. I tried making up some ground on a Willow Glen runner who was a few seconds ahead, but he was starting to make his move. I accelerated on the last quarter mile, starting my kick a little bit early. It was a risky move, but at this point in the race, I wasn’t planning on losing any more places or position. It was either states or bust. With 200m to go, a St. Francis runner streaked in front of me to the finish. I tried shifting into another gear, but I was spent. I wheeled over the finish line in 15:53, a 12 second improvement from my leagues performance nearly two weeks ago. I actually wasn’t sure whether I had made states or not, despite the live-timing results. Jake told me I finished 9th, so I thought I had a good chance of making it. I counted four team runners in front of me and realized that I had snagged the final qualifying slot to state. Sure enough, five minutes later, I checked the results on my phone. I scrolled down first, checking the team results to see if Lynbrook had qualified as a team. My heart sank as I saw that we had placed fifth, well behind the top three teams. However, a small “I” adorned my time, confirming my assumption that I had picked up the last qualifying slot for the state meet. Initially I felt relieved and elated… but then I felt a sense of survivor’s guilt. Only Justin and I would be heading to Fresno to run states in two weeks… but what about the rest of team? Why couldn’t they have made it with us? I comforted myself with the fact that I had given it my all during the race. Granted, I didn’t run the cleanest race – my form broke midway, I had sloppy racing tactics and strategy – but given the certain conditions, I ran to the best of my ability. Post-race photo with two supportive parents! On the way home, I felt a greater sense of relief. I could enjoy the next day running the half marathon without today’s race bearing on my mind. Plus, I would have nearly a two week break before states – plenty of time to rest up, stay healthy, and run a solid final race. I was looking forward to running at Woodward Park the whole season, because it is a very fun and scenic course to run on. I still remember my race at Clovis two years ago. Returning to the course as a senior, I was hoping to leave my mark there one last time. I also felt pretty strong and healthy coming off of a 9:58.6 two mile at Saratoga the Wednesday before. I was ready to run a solid race. The day before was very relaxed. I slept most of the way to Fresno, sneaking in some rest. We did a simple course jog in order to readjust ourselves to the different rolling hills and terrain. 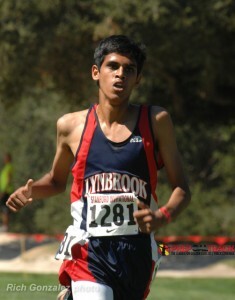 Only a few of us had run the course prior – Justin at states, and Revanth and me ran at the Clovis Invitational in 2011. We chatted casually and shared jokes about the car ride as we circled around Woodward Park. The atmosphere was a very lax one, which suited me as I tried to ease my mind off of other thoughts. After our jog, we posed together for a commemorative photo at the finish line together as a team. Lynbrook Cross Country the day before the Clovis XC Invitational. The pasta feed was much different than the ones back home. It was much more crowded, and there was a smaller selection of food as well. Multiple teams gathered together in the cafeteria, eating and talking together. Our team shared an entire table. The conversation flowed as we chatted about the season and prospects for the future. After a filling meal of spaghetti, bread, cookies, and iced tea, we filed out and headed back to the hotel. I didn’t do much after we returned to the hotel, zoning out all distractions and focusing on sleeping early. I asserted my authority over my teammates and made our room sleep by 10:30. We woke up at 4:45 next morning and hobbled into the elevator. We met our team for breakfast… but there wasn’t any breakfast set out yet! Instead, we resorted to rationing ourselves to meager servings of raisin bran. Race day felt much different. At 6 in the morning, we were the first ones on the course. It was pitch black outside as we walked with our gear. We set up close to the mile mark and caught up on our sleep. A few minutes later, the girls began to warm up; they were the first race of the day. Grace ran an aggressive race, finishing 4th in a very loaded field, which set the mood for the rest of us. We did a few loops following the second mile of the course as a warm up. There was a good amount of fog and morning dew lazily sitting around the lower patches of the course, making the environment a bit cooler. It was also pretty cold at the start line, but after a few strides that was the least of my worries. We lined up together in our box and waited anxiously for the gun. CRACK. The start was fast, as expected. Justin and I pushed hard to avoid getting boxed in within the first 600m. I was a bit conservative at first, and I lost track of Justin for a moment. I found my bearings again though and moved up into the lead pack, reuniting with Justin. We strode in sync and flew past the first mile… in 4:53. I had never really split a sub-5 first mile, and I was scared that I was in danger of burning out. I held on, keeping with Justin as long as I could. Justin and me coming off of the first mile together. Taken by Rich Gonzalez of Arcadia. When we starting turning downhill in the middle of the second mile, Justin started to break and make a move to stay in the lead pack. I was unable to cover the move. I was starting to become a bit tired, and it didn’t help that the second mile had a few steep climbs. Runners started to leak forward past me, but as soon as I reached the top of the hill I stemmed the trickle and tailed the small group of runners ahead of me. We came past the two mile mark at about 10:09. I wanted to break 16, and when I came past the 2.1 mile mark at 10:48, I knew I had to split about a 5:10 last mile to break the barrier. I was losing sight of Justin, so I started pushing harder back up the hills. I was making up ground on him and the other runners trailing the lead pack. With 800m to go, I lost sight of Justin around the bend. I focused on catching the two guys immediately in front of me, holding on to them with 600m to go. We turned into the woods and back to the finish. I didn’t know what time I was on pace for, but when I saw 15:30 on the clock as I came onto the grassy finish, I knew I was going to break 16. I pushed harder, but was running out of room to catch the two guys who had lead me over the last half mile. I stumbled into the chute, finishing behind the two guys and tenth overall, but not before I had broken the 16 minute barrier definitively, running 15:50. Kicking it into the finish. Although I was very pleased with my race, I couldn’t help and think that even greater things were in store for my final season. “Could I finish top 10 in state… or even break 15?” I asked myself. Maybe, but I kept things in perspective, shifting my focus towards CCS and sending our team to state. I knew that bigger PRs were within my reach – I just had to make the effort to grab them. But for now, I guess I’ll take things one step… or one stride at a time. Stanford has been infamous among Lynbrook runners for its notorious heat, cramped starts, and slow races overall. I don’t feel any of these pressures. For me, There has always been a PR in the cards at Stanford. I owe this I to the strength of my family behind me, my ability to negotiate the numerous bends with ease, and the rolling terrain of the course that is conducive to faster times. Coming off of a 16:26 at Crystal the past Tuesday, I was hoping to make a larger impact at Stanford on Saturday. In preparation for the race, I slept at 11, much earlier than I had been during the week. However, I was too nervous. I woke up at 5 in the morning in a cold sweat. Reassuring myself that everything would be okay, I fell back asleep and woke up two hours later. With regards to pre-race diet, my dad made me a special omelette sandwich on whole wheat with avocado and cheese. I scarfed down the bagel sandwich quickly, and nibbled on some almonds until it was time to go. The temperature started to pick up after our prolonged warmup. I began to sweat profusely – and the race hadn’t even started yet. I took generous sips of water, hoping to sustain the high heat before the start of our race. After our team’s Woh Bundy, we crowded onto the line for the start. Justin and I stood together on the front line as we waited for the starter’s signal. We shook hands with the team occupying the box left of us, who had made the trip all the way from Oregon. The starter swept his red flag across and then pointed both his flag and the pistol skywards. CLACK – he dropped his flag down and fired the gun simultaneously. Both Justin and me strode forward, trying to avoid the cramped central pack within the first 100 meters. We rounded the first turn, and… CRACK CRACK. Everyone skidded to a stop and heaved sighs of relief. All 243 of us retreated slowly to the start line again as the race crew helped a fallen runner to his feet. We lined up at the start again – once more, with feeling. CLACK. We were off again. Justin and I pushed forward, staying ahead of the massive chase pack. We regrouped together after the first 400m and settled into a comfortable pace around twentieth place. Justin and I stuck together for the next couple of miles. We matched each other stride for stride – we were in sync. Rounding the numerous bends and hairpin curves on the golf course, we worked our way to the front. Coaches stationed along the course would remind us about our position in the race and bark splits at the mile markers and 3K. Both Justin and me wanted to stay near the lead pack. The race was perfect. Heat wasn’t an issue for me, and I didn’t feel any pain. I was gliding along the padded grass, accompanied with Justin. Swinging around the halfway mark, we chased Ben Zaeske of Los Altos. We were moving together briskly, pushing forward and wrapping quickly around the tight turns. I could hear my dad cheering me on at the hairpin, and I accelerated harder, pushing up the slope to catch up with the now strung-out lead pack. Slowly but surely, we were working our way towards the front. We snuck our way into the top ten and held our line. With about 800 to go, I started accelerating up the slight gradient towards the finish straightaway. “If you’re feeling good, just go” Justin gasped. I nodded and moved up, matching a stride of another runner with a quarter mile to go. I could see the blurred digits on the clock as I strode closer. The clock struck 16 minutes, and I knew a great race was within my reach. I lengthened my stride and slackened my arms, straightening for home. An Oregon runner from the box adjacent to us shot ahead of me. I followed him to the finish, pushing through the chute. As I fiddled with my laces, fumbling the RFID timing chip off of my flats, I couldn’t help breaking into a smile. I had improved my time by more than half a minute, running a 16:25. To top it off, I had finished well in the top ten, and my adjusted time read a slightly faster 16:24.1. I grinned as I looked skywards, knowing that my uncle would’ve been proud. However, walking back to the car with my dad, I knew there was still work to be done. I thought ahead, setting my sights on a solid CCS race and a sub-16 5K. Even with the white Stanford top finishers shirt draped on my shoulders, I knew that there were still greater things on the horizon. This week marks one year since I ventured two thousand miles westward with my teammates to Oahu for five days. My teammates and I had been looking forward to this trip the whole summer. After all, for most of us, it was a commemoration of two or three years of service to a team that we all love so much. I couldn’t imagine spending five days with my favorite teammates in an exotic tropical locale… it felt like a delicious dream. However, my personal expectations fell short. It all began on Thursday, the day before the Iolani Invitational on Oahu. I was swimming with my friends in the ocean waters off of Waikiki Beach, soaking in the scenes of the urban Honolulu shore and the palm trees lining the thoroughfare that bordered the sandy beachfront. Honolulu was staggering, in a sense like a tropical Los Angeles. There was much vertical development, as well as chronic congestion and urbanization spreading northwards to the hillsides. My friends were climbing over the barrier that separated the lagoon with the Pacific Ocean. I followed suit and tried to negotiate the mossy rocky barrier. My feet slipped on the slick green moss as I tried to push against the heavy current sweeping me back towards the shore. “Come on, Rohit!” my friends shouted. “I’m coming!” I replied back. I regained my grip on the barrier and pushed off into the ocean. As I pushed off, I felt something prick my feet. The pain followed, and it felt as if I had shoved a hundred thumbtacks into the side of my left foot. Hurting, I floated back towards shore, swimming on my side. I turned my foot over to examine the damage. At first, I couldn’t fathom what I had just seen. It had look like someone had just jammed a black koosh-ball into my left foot. However, looking further, I realized that I had stepped on something when I had pushed off of the barrier… a porcupine… no… a sea urchin. The pain was diabolical. I pulled out as many needles as I could by hand and proceeded to walk on my toes back to the hotel. Some of my teammates had suffered a similar fate, and we all sat together in the same room while our friends proceeded to try and tweezer out any other needles. The needles were fairly deep in, and the pain wasn’t subsiding. We soaked our foots in baking trays of vinegar, hoping that the needles would disintegrate, neutralizing the pain. Although the soaking didn’t really help abate the pain a whole lot, just spending time with my teammates, knowing that all along they were their by my side making sure we were all okay was a heartwarming feeling. Jake took all three of us – Anjali, Rebecca, and me to the hospital. After doing a bureaucratic dance and filling out a mound of paperwork, the doctor ushered Jake and me to a room. The doctors’ advice wasn’t much different from what we had been already doing – they made me soak my foot in a warm bowl of vinegar. Hospital aside, my respect for Jake shot up that day because of what he did for me. He sat next to me and held my hand while I dealt with searing and throbbing pain in my foot. He took me to the hospital and took care of me, making sure that I was healthy and rested for tomorrow’s race. Though many members of Lynbrook’s Cross Country team would regularly rag on Jake for implementing harder workouts and not caring for his runners, I felt that he proved them wrong that day. Jake was there for me and my teammates. After getting used to my new stride, the pain subsided somewhat. That night, in honor of tradition, we held a pasta feed next to the hotel pool. I silently ate my spaghetti and meatballs with garlic bread while simultaneously visualizing the start of the race. I knew where I wanted to be, and where I wanted to finish. Tomorrow would come down to the execution. I woke up early in the morning to assorted sirens and screeches of the Honolulu urban setting. Taking advantage of the time to myself, I took the elevator to the 38th floor and soaked in the sunrise dawning over the central business district of Honolulu and the adjoining suburbs. I took a brief swim in the pool to cool myself, and unfortunately, there was still a deep soreness in my left heel. I hobbled out of the pool and ate a light breakfast in preparation for the race. The drive to Iolani Ranch was a long and arduous one, but like none other. We took the H-3 freeway to the Northeastern side of the island. The surroundings were a far cry from congested Honolulu. Here, the locals had adapted to a much more primitive lifestyle, living carefree from the urban influence trying to worm its way through the formidable mountain range that separated the two different cultures. Our team was fighting an uphill battle, literally and figuratively. Since Lynbrook had participated three years prior, the course had changed drastically. The hosts had added two gruesome climbs midrace that would send chills down any runner’s spine. The dirt trail was laced with hazards in the form of creepers that would snag any unaware feet. The course trail was littered with grassy patches and cow excrement that would throw wrenches in everyone’s stride. After a brief survey of the quaint new course, I took a nap, neglecting the humid weather. After a brief warmup, I was ready as I was ever going to be. The start setup was much different, with our teams in single-file at the start line. CLACK. I held my ground throughout the first 400m and tried to stay with the lead pack, since I wanted to medal. After navigating a few more tricky bends, we climbed up the first hills and hit the first mile at around 5:35. I was already exhausted, and was hanging on to the now thinning lead pack for dear life. My left heel screamed every time I landed on my port-side foot. During the race, I had to adjust my stride and run on my toes to avoid applying pressure on my needled left heel. My strides were much more conservative, and my racing form never really materialized and gelled in during the course of the 3 mile race. I couldn’t recount the rest of the race since it was all a blur. The race was a fleeting experience, lasting just over 17 minutes. I remember stumbling at the finish line, spent and exhausted. The tropical weather had drained me, and the hills and tricky terrain had decapitated what was left of my two legs. Upon exiting the chute, I hobbled towards our tent and didn’t even bother finding a place to sit down. I collapsed, letting my legs buckle underneath me. Needless to say, I was disappointed with myself. The thought of the race stung – traveling in excess of two thousand miles just to run a mediocre race. I curled myself into a corner on the bus ride back, wishing the minutes away. Looking back on the vacation as a whole, however, I feel that the journey was a success. I was exposed to a completely different culture, I bonded with my teammates, and I was presented with the opportunity of the lifetime. Such was my grief. My sorrow didn’t stem from running a disappointing race, nor did it stem from injuring myself so careless the day before an important meet. I had placed too much emphasis on the race, and in turn I didn’t enjoy myself as much as I should have. Following Hawaii, I loosened myself a bit and opened myself to new things. Hawaii taught me that failure hurts. However, Hawaii also taught me how to rebound and learn from my mistakes, but more importantly that I should invest time to cherish life’s joys as well. Truth be told, I actually enjoy running at Toro Park. Most of my teammates scorn at the thought of the loose sand on the course, the frequent dust storms during races, and the 75 mile drive to Salinas. For me, Toro Park is magical place where something is always in the cards. Thinking about the race, I was hoping this was indeed the case today. I couldn’t sleep the night before owing to immense anxiety. After all, it was the beginning of the end, the first race of my final season. I ceased all thoughts and sat silently on my bed, visualizing the start of the race. I would round the 315 degree turn in front, leading the pack, free of any worry. Or so I hoped. Race day felt much different, but maybe that was because I wasn’t on the boisterous bus ride with the rest of the team. Instead, I would be driving an air-conditioned Prius to the meet. My dad and I left San Jose leisurely at 10:30, four hours after the team left from Lynbrook. The drive to Toro Park was pleasant, with very light traffic on 101. Manning the steering wheel helped me ease and cease the aimless thoughts floating in my head. I stepped out of the car refreshed and ready, albeit very nervous. I warmed up on my own, jogging in silence for ten minutes. I slipped on my flats, tore off my shirt, and walked towards the start line. I squeezed myself into one of the center boxes, and I was all set. I did a couple of strides in an attempt to minimize the tension, but to no avail. The starter gave the typical race day spiel and pointed his gun skywards. “SET!” he bellowed. *Click*. The tension deflated like a popped balloon… the starter had ran out of blanks. The second time was a charm, and we all exploded from the start line. The start was diabolical. I didn’t stride up front to catch the sharp turn and was pushed towards the outside. Within the first 300m I had been jostled around and shoved to both sides of the trail. I calmly pressed on, returning any thrown elbows. I pushed forward on the next 300m, accelerating past the spot where my teammates cheered me on. Within a matter of meters, I had moved from 50th to about 25th, comfortably tailing the lead pack. Rounding the turn, we hit the first mile marker at cruising speed. I heard my first split as 5:25, and my heart sank a little. I was off pace for a sub-16 minute run. Nevertheless, I kept my eye on the runner in front of me and tailed him as we passed the halfway gauntlet and headed up the notorious hills. Ascending the hills wasn’t as hard as I thought it would be. I could hear my dad and coach cheering me on, providing exhortations that pushed me to accelerate even more. Descent was a different story. People began to trickle past me as I cautiously proceeded down the steep gradient. I knew there wasn’t much race left for me to continuing tailing people, so I began to make my move. Bursting out of the hills loop with 900m to go, Jake yelled something at me saying that I could go 16:40 if I tried. That would mean a very modest PR, but the alternative would mean that I would miss my mark for the first time at Toro Park. I surged forward with two competitors in close pursuit. Rounding the last few turns with 600m left, my shoelaces untied themselves and began to flail wildly with every stride. Untied shoelaces and loose footing became the least of my worries when both my competitors silently pushed forward and overtook me. I began to let up a little, knowing that I would lose the battle of the kick. I couldn’t toss a race away that easily however. I sat behind both of them, nearing the finishing gauntlet with the last two hundred meters in sight. Then something happened. I did something that I was unable to do during summer preseason and training. I kicked and closed out. I could hear my dad again, shouting for me to finish the race. I went into overdrive and took on a sprinter’s form. I pumped my arms and accompanied them with longer strides as I pushed towards the tape. The clocked flickered faster, ticking through the digits. I crossed the finish line and barreled through the chute, unable to stop. I was spent, but I was happy and grinning inside. I had finish twelfth out of a vast field of nearly 200 runners. I emerged out of the chute sweating, exhausted, and depleted. However, I couldn’t have been more content as I shared high-fives and handshakes with the rest of my teammates. I later learned that I had PRed by a mere two seconds. I felt a little disappointed inside since I was hoping to shatter the elusive 16-minute barrier at Toro. Someone later told me that the mercury had shot up during the race, hitting a scorching 93 degrees. I began to put things in perspective, and suddenly the race felt more and more as a personal victory. I was definitely content with how the race played out overall. Looking forward, I think I will have to be weary of the start and mid-race development at Crystal Springs on Tuesday. There are still many chances for me to break the 16-minute barrier, and even going for sub-5 pace overall as well. It’s 85 degrees outside, and there’s no wind or breeze. The sun beats down, relentlessly, worming its fingers through the inconsistencies in the canopy of oak. A team of forty makes its way along the gravel and paved “Creek Trail,” towards the shadier Murdock Park, in hopes of finding shelter from the ruthless sun. Jake hasn’t said a word, but I know what’s coming. It’s going to be six intervals of 1200 meters. I heave exasperatedly and toe the line along others. This is what I had prepared for. During the summer I had ran workouts from start to… almost the finish. I would fizzle out on the last interval, the last mile. I invested time in an effort to improve my closing speed – striding, leading interval workouts, and trying to cement the last meters of a race. I lead the guys on as we start our workout. The first, second, third, and fourth intervals move seamlessly, illustrating the rhythmic cycle of timed workouts. Shirts off, and it’s the penultimate interval. People begin to drop like flies, buckling under the immense heat. I keep my eye behind Justin, and float on his draft to the finish. My watch flickers through the digits, ticking off seconds of my rest as I’m bent double and feel my lemon rice lunch shooting up my throat. We get on the line one last time, and too tired for words, I make a halfhearted gesture signaling the start of the ultimate interval. We’re skipping through the woods, protected by the dense, interlocking branches of the trees bordering the intermittent San Tomas Aquino Creek. We hit the turnaround, and it’s the last 600m of the workout. I push forward and make my move. Revanth and Justin follow me around the bend as we break out into the sun again. It’s 300m to go, and I shove the thoughts of a glass of ice cold water and a hearty dinner to the back of my head as I surge into overdrive. I’m sprinting to the finish now, I can see my parents and my teammates on the side, providing exhortations as I bound towards the tape. I let it get to my head though, telling myself that I’ll finally close out a workout. I let my guard down and break the rhythm in my stride. Andy passes me and hits the tape just as I throw myself across the finish line. Frustrated emotionally and physically, I take off my shoes and spike them against the ground in a fit of fury. I silently fume and utter some choice blessings as I walk alone to the water fountain. My anger is visible, and there’s a black cloud hovering above my head in the clear sky. I grab my shirt angrily without saying much of a goodbye to Jake and my other teammates. I jog back to Lynbrook in silence, replaying the finish in my head. The smug grin on his face, the sweat blurring mine, and the image of defeat polluting my thoughts all echo simultaneously in my mind. I sit silently on the benches outside the locker room. I can’t move because the workout has drained me dry, literally. I’m dehydrated, and I’m drenched in a solution of sweat and tears. I throw my bike helmet on the ground, frustrated at my helplessness. I bike home listlessly, trying to expel the thoughts of the recent workout. I get home and sit outside, thinking about why I run. I think back to my uncle, and my heart lurches for the thousandth time. Even as he fought with cancer, he would always make the effort and talk to me about my races and training. He held an interest in me, which was my central motivation to run. I reflect on my behavior and realize that frustration isn’t something he would’ve seen as a proper reaction after a difficult workout. I resolve to keep a cool head in a sea of heat, vowing to never lose my temper in such a fashion again. I consider myself lucky that Monday wasn’t a race day.